When it comes to preparing for natural disasters, Dennis Hwang wrote the book - literally. Hwang is a Coastal Hazard Mitigation Specialist with Hawai‘i Sea Grant and co-author of the Homeowner’s Handbook to Prepare for Natural Hazards. Since its first publication in 2007, the handbook has gone through three editions, with a fourth edition on the way thanks to appropriated funds from the Hawai'i Legislature. Over 75,000 copies have been distributed, and the electronic version is also freely accessible online. 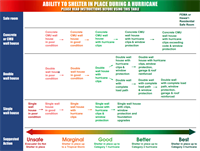 The Hawai'i Sea Grant Homeowner's Handbook Shelter-In-Place table provides guidance for determining the strength of your house. Written specifically for homeowners, the handbook is based on three main principles: (1) Providing information in a way that is easy to understand, with pictures and step-by-step instructions; (2) Educating and informing the homeowner of hazard risks in their area; and (3) Offering as many options or solutions to the homeowner as possible that are relevant, reasonable, and cost effective. Some of the new additions to the most recent version of the Hawai'i Homeowner's Handbook include a Shelter-in-Place Table which provides guidance for deciding to shelter in your home, information on new ways to retrofit homes that can reduce damage from earthquakes and hurricane winds, and expanded sections on threats from other hazards like volcanoes, wildfire, drought, and climate change. The cover of the Hawai'i edition of the Homeowner's Handbook.